The cars pass... slowly. What compels them to move at such a snail's pace, and then I see it. 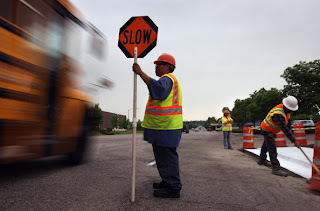 Nathan Jacobson, a road construction flag waver guy furiously tapping his “SLOW” sign, and everyone does as his sign commands. What struck me about Jacobson is how in the zone he seemed. Even people in yellow cars, notoriously known for driving ridiculously fast and/or being a taxi drove at reasonable speeds. Obviously Jacobson had struck a chord with the world, and I needed to find out his secret. There was a method to his madness. I needed to know more. Redundancy made it slightly less fascinating, but still fascinating nonetheless. “You better believe he slowed,” Jacobson said. At this point, one of Jacobson's fellow sign tappers noticed the conversation and came over to join in. “Yeah, SLOW should be universal,” I said as I hopped in my car and sped away. No matter how many times he tapped that sign, I wasn't coming back nor slowing down.